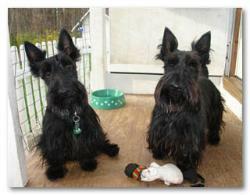 Happy Ever After: Finnegan & Moira – Scottish Terrier Club of Greater New York, Inc.
An adorable pair of three year olds, Finnegan & Moira were turned in by a family in NY state who were too busy with their kids and work to give the dogs enough attention. The pair was shy, but affectionate and beautifully behaved. We decided to hold out until we could find a home for them together since they had grown up together since puppyhood and were very bonded. One of our past adopters, a couple living in Northport, NY, had lost their beloved long time rescue, Shamus, to cancer. Since Shamus had come from us, the couple turned to us once again, and we agreed to have Finnegan & Moira join them and their other dog, a Westie. Now the three dogs bound up and down the hallways together with glee! Moira has attached herself to the woman and Finnegan to her husband! We couldn’t be happier with how things ended up for them all!